The only selling point Republicans have left to justify their tax law is their oft-stated belief that it will spur growth and EVERYONE will benefit. Unfortunately, the nonpartisan Congressional Budget Office (CBO) and the overwhelming majority of macro economists do not agree with their hype. Republicans promised historic tax reform. Actual reform to simplify the tax code and eliminate loopholes would take time and considered compromises. The Republicans decided they didn’t have time and proved they didn’t care about real simplification. With a 500-page tax bill, I’ll bet the Internal Revenue Code and its regulations will be expanding, not contracting. Most economists agree the changes will result in some growth because the increased budget deficit provides a stimulus to our economy (which is already generating record corporate profits and nearly full employment). However, virtually all economists maintain the growth will be insufficient to pay the costs of the tax-cut stimulus. Three charts to illustrate why the Republicans are mistaken in believing their myths. In 1950 the top income tax rate was 90% (gray line). The top corporate rate was 42%, which was increased to 52% by 1952 (orange line). The blue line shows annual changes in real GDP (multiplied by ten to show on the same scale). It varies a lot year by year, but during the 1950s averaged 4.06%. Corporate rates in the 1960s stayed about the same. The maximum personal income tax rate declined from 91% to 70%. Average real GDP averaged 4.43%. Aha! Maximum income tax rates go down and average real GDP increases. Except with that 70% rate maximum in place throughout the 1970s and a slight decline in the corporate rate, real GDP annual increase averaged only 3.55% that decade. Hmm. In 1987, maximum tax rates for both individuals and corporations were significantly reduced. The average annual real GDP increase fell to 3.15% for the 1980s. The maximum individual rate dropped for many years to 35%, but the average annual growth in real GDP during the first decade of the 2000s declined to 1.83%, and for the last six years has only increased to 2.09%. This year real GDP looks to grow something over 3%. 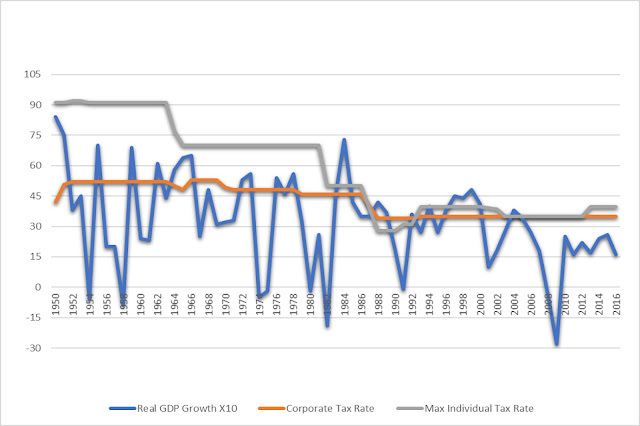 If maximum corporate and personal income tax rates were the only or even main driver of real GDP growth, we should go back to the high tax rates of the 1950s! They’re not of course, but here’s one major problem with trickle-down economics. Give a billionaire an extra $100 and nothing changes for him. Give someone earning $20,000 a year that same $100 and chances are good they will spend every single one of those greenbacks. That spending is what increases GDP. 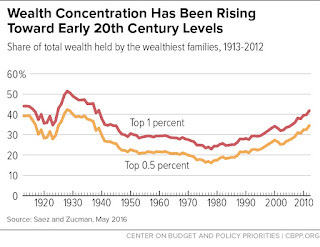 Consider these two graphs showing the portion of income going to the top 1% and the portion of wealth owned by the top 1%. During the 1950s, 1960s, and 1970s when we had significantly higher corporate and personal income tax rates, and the percentage of before-tax income going to the top 1% declined, real GDP growth averaged 4.01%. 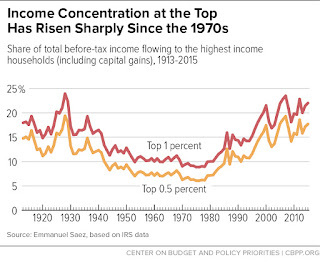 In the 1980s, 1990s, 2000s, and the 2010s, while the income to and wealth accumulated by the top 1% has increased substantially, the average real GDP growth has been only 2.61%. 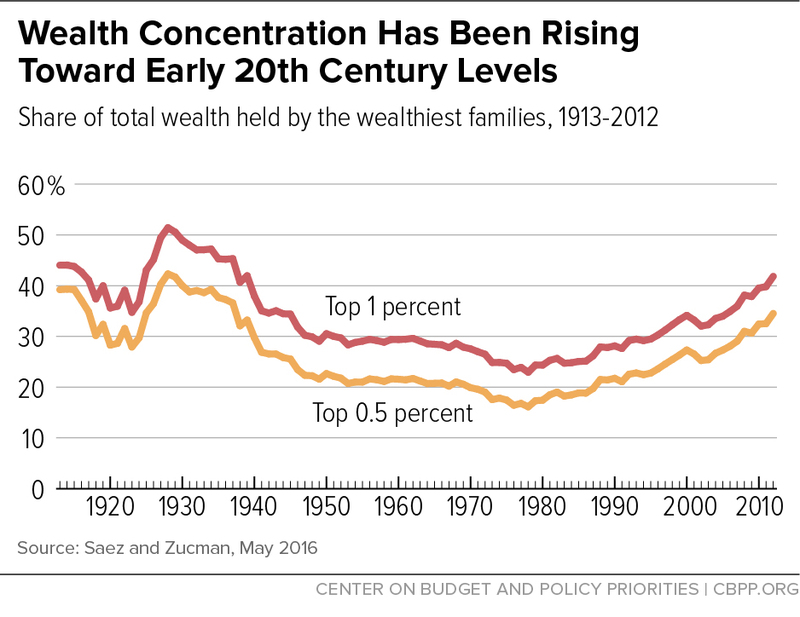 The Republican tax proposals will increase, not decrease income and wealth disparity. 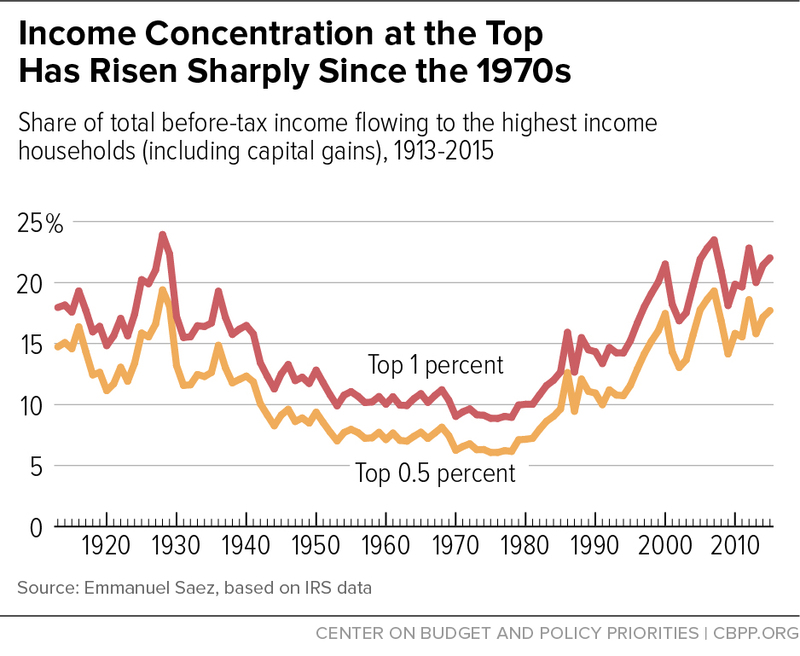 If one’s primary objective were to increase real GDP growth, one would skew the benefits of tax law change away from the top income-earners and toward lower income-earners. If one’s objective is to benefit high income and wealthy individuals, the Republican plan should work quite well. That one is a much taller order only because of all the interconnected wheels. What is clear is that many Republicans are willing to starve governments in order to shrink them. What we need is a full-throated debate about how we spend our money. I do have some things to say about that debate. Stay tuned.